“Because I gave him my word” was the answer to the question I had just asked. The question was, “How does he know you will pay him?” It was an interesting conversation, and one that I’ve remembered for almost 50 years. I posted a comment about reputation to my Facebook page yesterday: People wouldn’t have to spend so many minutes protecting their reputation, if they would pause for 60 seconds to guard their character. Since we have been declared righteous by faith, we have peace with God through our Lord Jesus Christ, through whom we have also obtained access by faith into this grace in which we stand, and we rejoice in the hope of God’s glory. Not only this, but we also rejoice in sufferings, knowing that suffering produces endurance, and endurance, character, and character, hope. And hope does not disappoint, because the love of God has been poured out in our hearts through the Holy Spirit who was given to us. 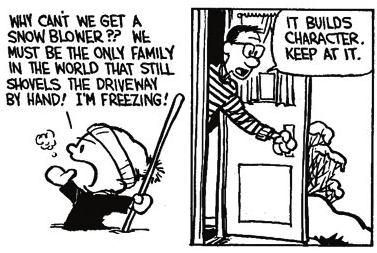 I’m not sure that Paul would agree with Calvin’s dad, but you may have the opportunity to build some character with snow in the forecast for this weekend.